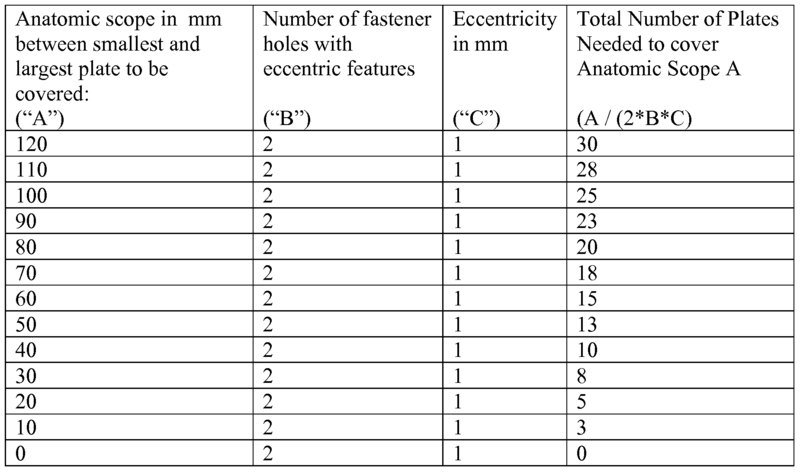 An anterior transpedicular bone fixation device (100) includes a first plate (105) having at least one fastener hole (120a) configured to receive at least a portion of a first bone fastener and a first rotatable eccentric member (112). The first eccentric member has a first aperture (106) for receiving at least a portion of a central fastener (108). A second plate (110) has at least one fastener hole (120c) configured to receive at least a portion of a second bone fastener and a second rotatable eccentric member (114) with a second aperture (107) for receiving at least a portion of the central fastener, wherein the first and second rotatable eccentric members enable the first plate and second plate to translation with respect to one another. The orientation of the first plate with respect to the second plate can be fixed by advancing the central fastener through the apertures. This application claims the benefit of U.S. Provisional Application No. 61/098,036, filed on September 18, 2008, entitled "ANTERIOR TRANSPEDICULAR SCREW- AND-PLATE SYSTEM," the contents of which is incorporated in its entirety by reference herein. Multilevel cervical spinal procedures result in relatively large loads on anterior cervical screw and plate systems, particularly in cases of severe three-column subaxial cervical spinal injuries and multilevel plated reconstructions in osteoporotic bone. Supplemental posterior instrumentation is therefore recommended to increase primary construct rigidity and limit potential compromise of the screw and plate systems. The increasing number of successfully performed posterior cervical pedicle screw fixations have enabled more stable fixations, however, most cervical pathologies are located anteriorly and are preferably addressed by an anterior approach. Additionally, the use of pedicle screw fixations in the vertebrae area are typically limited by the position of the screw because improperly placing the screw results in potential arterial or spinal cord damage. NY 72204812v3 fixation and expands the translation of the bone plating system while maintaining the proper bone screw placement. least one rotatable eccentric compression ring is configured and dimensioned to permit the plate to translate relative to the at least one fastener. insertion of a threaded locking screw wherein when the threaded locking screw is threaded into the head of the fastener, the radial wall is expanded outward to interact with a wall of the eccentric compression ring. Fig. 9 illustrates a top perspective view of the plate of Fig. 7A mounted to an anterior portion of the spine. NY 72204812v3 orientations in the human body to which reference is made and are not meant to be limiting. The terminology includes the above-listed words, derivatives thereof and words of similar import. Certain embodiments of the present invention will now be discussed with reference to the aforementioned figures, wherein like reference numerals refer to like components. Preferred embodiments of the present invention are directed to a cervical anterior transpedicular screw- and-plate system. However, the preferred embodiments of the screw-and-plate system are not limited to applications or mounting in the anterior spine and may be utilized in the lumbar spine or for mounting to other bones in the human body, as would be apparent to one having ordinary skill in the art. NY 72204812v3 reference and application to the spine, it will be appreciated that features of the plates and the plates may have other applications, and can be applied to other bones and/or parts of the skeleton. Referring to Figs. 1-6, a first embodiment of the system includes a locking plate 100, which has an upper plate 105, a lower plate 110, and a longitudinal axis A-A. The upper plate 105 has a rotatable, ring-shaped eccentric member 112, which contains an off-center aperture 106, and the lower plate 110 has a rotatable ring-shaped eccentric member 114 that contains an off-center aperture 107 for rotatably interconnecting the upper plate 105 to the lower plate 110 via a central screw 108. The first preferred embodiment of locking plate 100 includes two fastener holes 120a, 120b at an end of upper plate 105 and two fastener holes 120c and 12Od at an end of lower plate 110. The fastener holes 120a, 120b, 120c, 12Od may be configured to receive at least a portion of a bone fastener (See, for example, bone fastener 715 (Fig. 7B)), which may be inserted into a bone segment, such as a vertebral body (See Figs. 6 and 9). Although the plate 100 is shown with two pairs of fixation holes 120a, 120b, 120c, 12Od, more than two pairs may be provided, for example so that plate 100 may span a greater length and thus be fastened to multiple locations along the spine or across multiple levels. Single holes (not shown), alternatively, may be provided as opposed to the pairs of fastener holes 120a, 120b, 120c, 12Od. Additionally, each fastener hole 120a, 120b, 120c, 12Od may contain a compression ring (not shown), as would be apparent to one having ordinary skill in the art, to receive the bone fasteners and the plate 100 may also have one or more visualization windows (not shown) extending from the upper surface of upper plate 105 through the lower surface of upper plate 105. The window may provide visual access to a disc space below the plate 100 when implanted into a patient's body. NY 72204812v3 individually or in concert to allow the upper and lower plates 105, 110 to translate relative to each other. As can be seen in Figs. 4B and 5B, when the off-center eccentric member 114 of the lower plate 110 is rotated, thereby moving the off-center aperture 107 further away from the distal end of the lower plate 110, and closer to the distal end of the upper plate 105, the lower plate 110 is translated away from the upper plate 105 creating a greater length along the longitudinal axis A-A of the plate 100. Similarly, when the off-center eccentric member 112 of the upper plate 105 is rotated, thereby moving the off-center aperture 106 further away from the distal end of the upper plate 105 and closer to the distal end of the lower plate 110, the upper plate 105 is translated away from the lower plate 105 creating a greater length along the longitudinal axis A-A of the plate 100. Thus, as the off-center eccentric members 112, 114 are rotated in varying degrees, the length of the plate 100 along the longitudinal axis A-A is varied. As can be seen in Figs. 4C and 5C, when the eccentric member 114 of the lower plate 110 is rotated to allow the aperture 107 of the lower plate 110 to be in its furthest position along the longitudinal axis A-A relative to the distal end of the lower plate 110 and the off-center eccentric member 112 of the upper plate 105 is rotated to allow the aperture 106 of the upper plate 105 to be in its furthest position along the longitudinal axis A-A relative to the distal end of the upper plate 105, the plate 100 attains its greatest length along the longitudinal axis A-A. Similarly, as will be appreciated by one of ordinary skill in the art, the upper and lower plates 105, 110 can attain varying horizontal translation relative to each other and the longitudinal axis A-A by rotating either or both of the eccentric members 112, 114 so that the apertures 106, 107 are positioned at various locations along a horizontal axis of plate 100, wherein the horizontal axis is generally perpendicular to the longitudinal axis A-A. NY 72204812v3  In conventional plating systems, a surgeon typically needs to rely on several different sized bone plates in order to account for the large number of possible dimensions of a patient's anatomy. In contrast, the use of the eccentric members 112, 114 of the plate 100 of the first preferred embodiment enables the use a limited number of different bone plates to account for the differing dimensions of a patient's anatomy. For instance, the below calculation illustrates how it is possible, through the rotation of the eccentric members 112, 114, to encompass a vast array of vertical distances with a limited number of plates. Where the eccentricity of the eccentric member 112 (e.g., in mm) of the upper plate 105 equals a distance between a center of the eccentric member 112 of the upper plate 105 and a center of the aperture 106 of the upper plate 105 and the eccentricity of the eccentric member 114 (e.g., in mm) of the lower plate 110 equals a distance between the center of eccentric member 112 of the lower plate 110 and a center of the aperture 107 of the lower plate 110, the maximal variability of the plate 100 along the longitudinal axis A-A would equal two times the eccentricity of the eccentric member 112 of the upper plate 105 plus two (2) times the eccentricity of the eccentric member 114 of the lower plate 110 ((2*eccentricity 112) + (2* eccentricity 114)). As mentioned above, the length of the plate 100 along the longitudinal axis A-A can be varied by rotating each or both of the eccentric members 112, 114 resulting in a single plate 100 that can be used for patients with varying anatomical dimensions. One exemplary surgical technique for implanting the plate 100 is described below, however, those skilled in the art will appreciate that the plate 100 utilizing numerous techniques and/or surgical steps that would be apparent to one having ordinary skill in the art, following a review of the present disclosure. NY 72204812v3  In use, for implantation of the plate 100 in the middle and lower cervical spine, an anterolateral approach is preferred. If the plate 100 is to be extended over several segments of the spine, a long incision is preferred. When exposing the vertebral bodies, the anterior longitudinal ligament is preferably removed or incised only in the areas where the intervertebral disc is to be bridged by the plate 100. Such a technique limits damage to the anterior longitudinal ligament in adjacent segments. After the incision has been made, an image intensifier tool, such as Fluoroscopy (not shown), may be used to guide and monitor guide wires which are placed in the vertebra, preferably from the anterior side. Using spreaders, the cranial and caudal end-segments of the spine are spread and a corpectomy implant or natural bone is implanted to replace the removed segments. The distance between the guide wires is measured with, for example, a caliper instrument (not shown), which measurement can be utilized to determine plate size. Once the distance is determined, the plate 100 is preferably adjusted to the ideal length by rotating the eccentric members 112, 114 of the upper and lower plates 105, 110 and the adjusted plate 100 is placed over the guide wires. Once the proper size has been determined, before or after screws or fasteners have been inserted into the patient, the plate 100 is preferably locked by tightening the central screw 108. NY 72204812v3 screws is disclosed in U.S. Patent No. 6,235,033, entitled "Bone Fixation Assembly", the contents of which are incorporated herein by reference. NY 72204812v3 fourth fixation holes 702b, 704b while first and second fixation holes 702a, 704a may contain the concentric compression rings 706. Alternatively, differing shapes (not shown) of the compression rings 706, whether rotatable or fixed such as hexagonal, star-shaped etc. may be used. Because of the eccentric nature of the compression rings 706, the screws 715 inserted into the rotatable eccentric compression rings 706 are offset from the center of the ring 706. The offset insertion and rotatable features result in both horizontal and vertical translation of the plate 700 relative to the longitudinal axis A-A. This translation is in addition to any angling of the bone screw 715 that may result from the use of the compression ring 706. For example, in addition to any translation that is enabled by the rotatable eccentricity of the compression ring 706, the compression ring 706preferably enables up to approximately twenty degrees (20°) of additional movement relative to the plate 700. Moreover, due to the rotatable eccentric compression ring 706, differences in medial-lateral entry point of the fasteners 715 can be overcome. Where entry point differences are impossible to correct, in cranial-caudal minimal and maximal distance, use of the rotatable eccentric compression rings 706 results in a small off- angle placement. NY 72204812v3 preferably from the anterior side. Using spreaders, the cranial and caudal end-segments are spread and a corpectomy implant or natural bone is implanted to replace the removed segments. The distance between the guide wires 810 is measured with, for example, a caliper instrument (not shown) so that the surgeon can select a size for the plate 700. The rotatable eccentric compression ring(s) 706 are then preferably placed around the guide wires 810 so that the plate 700 is guided to and correctly positioned against the bone. The fasteners 715, which are preferably cannulated screws, are guided over the guide wires 810 and inserted through the eccentric compression ring(s) 706. As shown in Figs. 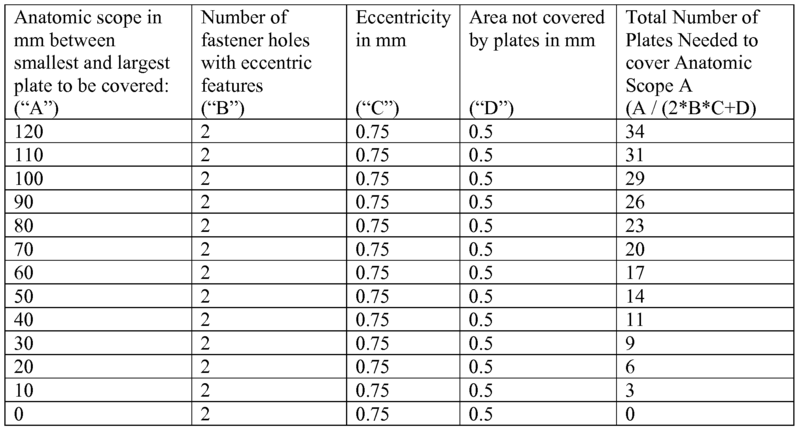 8B-8D, only the third and fourth fastener holes 702b and 704b include eccentric compression rings 706, however, as discussed above, any number of the fastener holes may include the eccentric compression rings 706, which would vary the eccentricity of the plate 700. Although the cannulated screws 715 are preferably used, any heretofore known or hereafter developed fixation device or means of fixation can be used. For example, cortical, pedicle or spongiosa screws may be placed into the vertebral body to fasten the plate 700. In addition, the cortical or spongiosa screws may be locked using conical locking screws, as will be described in greater detail below. Once the screws 715 are inserted, the guide wires 810 are preferably removed. The head of the screw 715 may include a recess 812 for the insertion of a conical locking screw 815, which locking screw 815 can thread into the recess 812 and lock the screw 715 in place relative to the plate 700. Once the fasteners 715 have been inserted through the eccentric compression ring(s) 706 and the guide wires 810 have been removed, the locking screw 715 is preferably inserted into the head of the screw 715, thereby locking the inserted screw 715 in place. NY 72204812v3 holes. As with the screws 715 that are inserted into the fastener holes with rotatable eccentric compression rings 706, the screws 715 that are inserted into the remaining fastener holes may be any heretofore known or hereafter developed fixation device or means of fixation including but not limited to a screw whose head can accommodate a fixation screw as discussed above. It should be noted that the symmetry of the plate 700 preferably allows for left and right approaches into the patient's spine. Additionally, as can be appreciated by those skilled in the art, when the plate 700 is inserted in the lumbar region of the spine, it can be combined with a plurality of anteriorly placed screws 715, which may eliminate the need for posterior instrumentation in certain circumstances. Because of the small angle between the sagittal plane and the pedicles in the human spine, the entry points of the guide wires 810 are unlikely to cross each other on the anterior vertebra. Referring to Figs. 10A- 1OC, a third preferred embodiment of a bone plate fixation system includes a rotatable eccentric compression ring 1012 and a slot-shaped fixation hole 1006 for insertion of the bone fasteners 1015, 1016, which enables additional compression of a fracture gap after the fasteners 1015, 1016, 1018a, 1018b have been placed in a bone plate 1000. The fixation system of the third preferred embodiment includes the bone plate 1000 with first and second fixation holes 1003 1004a, 1004b and a slot-shaped fixation hole 1006. Although the plate 1000 is shown with four fixation holes 1003 1004a, 1004b, 1006, more or less than the four fixation holes 1003 1004a, 1004b, 1006 may be included in the plate 1000, for example, so that the plate 1000 may span a greater or lesser length and thus be fastened to different and/or multiple locations along a bone fragment. The bone plate 1000 preferably includes at least two fasteners 1015, 1016, 1018a, 1018b for each bone fragment. NY 72204812v3  The slot-shaped fixation hole 1006 preferably allows translation of the fastener 1016, in situ. Each of the fixation holes 1006, 1003 1004a, 1004b, which may be configured to receive at least a portion of one of the bone fasteners 1016, 1015, 1018a, 1018b, respectively, extends between the top and bottom surfaces of the plate 1000 in a mounted position. The first fixation hole 1003 preferably includes the rotatable eccentric compression ring 1012. Multiple of the fixation holes 1006, 1003 1004a, 1004b may contain the rotatable eccentric compression ring 1012, while other of the fixation holes 1006, 1003 1004a, 1004b may also contain the concentric compression ring 1012 or no compression ring at all. Alternatively, differing shapes of the compression rings 1012, whether rotatable or fixed, such as hexagonal, star-shaped etc. may be used. Because of the eccentric nature of the compression ring 1012, the screw 1015 is offset from the center of such the compression ring 1012. The offset insertion and rotatable features result in horizontal and/or vertical translation of the plate 1000 relative to its longitudinal axis. This translation is in addition to any angling of the bone screw 1015 that may result from the use of the compression ring 1012. For example, in addition to any translation that is enabled by the rotatable eccentricity of the compression ring 1012, the compression ring 1012 preferably enables up to approximately twenty degrees (20°) of additional movement relative to the plate 1000. Additionally, as can be seen in Figs 10A- 1OC, the fastener 1015 may have a conical threaded head, which when inserted into the fixation hole 1003, can expand the compression ring 1012, thereby locking the fastener 1015 in place. NY 72204812v3 the bone using fasteners 1016, 1018a, 1018b. Once the fastener 105 has been partially inserted into the fixation hole 1003, at the surgeon's option, the compression ring 1012 can be rotated up to one hundred eighty degrees (180°) which allows the surgeon to compress the fracture gap, as a corrective action, without affecting the alignment of the fragments. Once the proper position for the fastener 1015 has been selected and the compression ring 1012 is appropriately rotated, the fastener 1015 is then implanted. NY 72204812v3 but it is intended to cover modifications within the spirit and scope of the present invention as defined by the appended claims. 1. A bone fixation device having a central longitudinal axis comprising: a first plate having an upper surface and a lower surface, at least one fastener hole configured to receive at least a portion of a first bone fastener, the fastener hole extending from the upper surface through to the lower surface, and a first rotatable eccentric member, the first eccentric member having a first aperture for receiving at least a portion of a central fastener; and a second plate having an upper surface and a lower surface, at least one fastener hole configured to receive at least a portion of a second bone fastener, the fastener hole extending from the upper surface through to the lower surface, and a second rotatable eccentric member, the second eccentric member having a second aperture for receiving at least a portion of the central fastener, wherein the first and second rotatable eccentric members enable the first plate and second plate to vertically translate with respect to one another, and the orientation of the first plate with respect to the second plate can be fixed by advancing the central fastener through the first and second apertures. 2. The bone fixation device of claim 1 wherein the first and second rotatable eccentric members further enable the first plate and second plate to experience horizontal translation with respect to one another. NY 72204812v3 the second aperture is in its furthest position along the central longitudinal axis from the at least one fastener hole of the lower plate. 4. The bone fixation device of claim 1 wherein the bone fixation assembly attains its minimum length along the central longitudinal axis when the first aperture is in its closes position along the central longitudinal axis to the at least one fastener hole of the upper plate and the second aperture is in its closest position along the central longitudinal axis to the at least one fastener hole of the lower plate. 5. The bone fixation device of claim 1 wherein at least a portion of the lower surface of the upper plate and at least a portion of the upper surface of the lower plate comprise a roughness to enable friction between said portions when the central fastener is inserted through the first and second apertures. 6. A bone fixation system comprising: a plate having a central longitudinal axis, the plate including a top surface, a bottom surface and at least one fixation hole extending between the top and bottom surfaces; at least one rotatable eccentric compression ring disposed in at least a portion of the at least one fixation hole; and at least one fastener including a head and a threaded shaft, the at least one rotatable eccentric compression ring is configured and dimensioned to permit the plate to translate relative to the at least one fastener. 7. The bone fixation system of claim 6 further comprising a slot extending through the central longitudinal axis of the plate. 8. The bone fixation system of claim 6 wherein the plate has a plurality of fixation holes and at least one of said plurality of fixation holes fasteners has a concentric compression ring disposed therein. 9. The bone fixation system of claim 6 wherein the at least one fastener comprises: a threaded shaft and a head, the head including a radial wall and open end defining a recess for insertion of a threaded locking screw wherein when the threaded locking screw is threaded into the head of the fastener, the radial wall is expanded outward to interact with a wall of the eccentric compression ring. NY 72204812v3 distance between the fastener hole in the first plate and the fastener hole in the second plate equals the measured distance between the guide wires; inserting the central fastener through the first and second apertures; and attaching the first plate to a first bone segment with at least one bone fastener, and the second plate to a second bone segment with at least one bone fastener. JP2019037782A (en) * 2017-08-24 2019-03-14 ジンマー ゲーエムベーハー Method of coupling orthopedic plates, orthopedic device, a bone segment, and a method of assembling an orthopedic plate.